"The Centrifugal Experience of Knowledge"
And two further problems were perhaps still more serious, at least in the minds of some 18th-century intellectuals: encyclopedias built on the division of knowledge into branches could, in theory at least, do an excellent job of identifying and organizing what people already know; but what good were they for generating new knowledge? Moreover, what strategies did they possess for distinguishing, in an age of wildly proliferating print, actual knowledge from the nonsense and half-truths that the printers and booksellers and journalists of Europe were all too happy to peddle? As Immanuel Kant wrote in his famous essay "What Is Enlightenment? ", "It is so easy to be immature. If I have a book that has understanding for me," that is, does the work of understanding for me, " … surely I do not need to trouble myself." It is at this point, argues Wellmon, that the modern research university emerges. 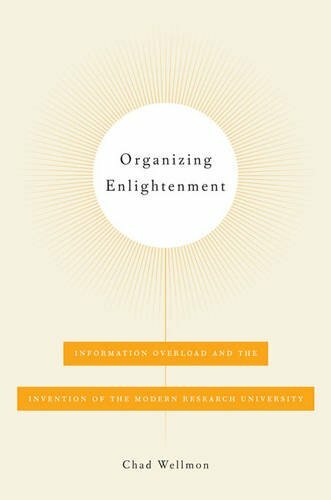 He presents in powerful detail the case that the university as we know it today arose in Germany as an attempt to continue the knowledge-organizing work that the encyclopedists had begun, but to provide a network of practices that could reliably assess existing truth-claims and discover yet-unknown truths, and—this is essential to that founding conception—to put all of these practices in the service of creating wise and virtuous young men. The choice of the university as the social institution within which to pursue these reforms and social goods was by no means an obvious one. Throughout the 18th century, German universities were suffering declining enrollments—Wellmon notes that there had been a total of 4,400 students in 1720, 3,400 in 1790, and only 2,900 in 1800—and seemed to do very little teaching, serving instead primarily as social clubs for rowdy young men. Many German political and social leaders thought the universities should simply be shut down. The remarkable thing, I found myself thinking as I read Wellmon's narrative, is that a handful of first-rate thinkers saw the state of the universities as an opportunity to be exploited rather than a disease to be eradicated. It may not be the worst thing in the world that Bildung has never truly had a formal institutional home. For Schelling, the eighteenth-century university reproduced the effects of information overload in institutional and pedagogical form. It not only hindered the advancement of knowledge but also threatened the integrity of the individual by producing distracted, unreflective young men. The university, especially the Enlightenment university that valued utility above all else, had been complicit in fomenting this epistemological and ethical crisis, and it was incumbent upon a vanguard of thinkers to reimagine the university as not simply an efficient institution, but rather the institutional embodiment of a distinct practice, namely, science. Only science as a practice, as a source of internal goods and virtues, not better textbooks or more complex encyclopedias, could address the epistemic and ethical effects of information overload. The task of the university was to form subjects of knowledge capable of navigating the oceans of print. It was to transform a student's vision of the world and shape their character, to fuse epistemology with ethics. The German word for science, Wissenschaft, is rather broader than what we today would call science: the Wissenschaften are the academic and scholarly disciplines, including not just the natural sciences (Naturwissenschaften) but also the social sciences and humanities (Geisteswissenschaften), politics and law (Rechtswissenschaften), and so on. Wissenschaft is not just reading or even studying, but the disciplined, orderly, critical, systematic pursuit of a particular body of knowledge. 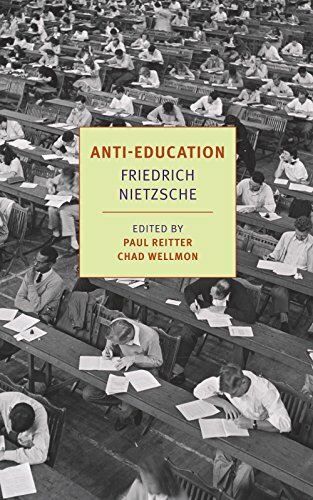 This enterprise, properly pursued, is in the strongest sense "character-forming": "It was to transform a student's vision of the world and shape their character"—and when Wellmon writes of education as a shaper of character, he always has in mind that complex, powerful, and distinctively German word Bildung. It is telling that the root of this word, Bild, means "image": what education, properly speaking, does for you is to form you in a particular image of virtue or excellence until that form stabilizes you and you become who you properly are. Many literature students learn about the Bildungsroman, commonly translated as "novel of education," but what that word really means is "novel of personal growth and character-formation." The Bildungsroman tells the story of how a chaotic and vacuous youth is shaped by powerful experiences in such a way that he or she becomes a fully-formed and stable adult.